In 1950 Henry Moore produced several drawings for the book A Land (1951) by Jacquetta Hawkes. In this highly poetic, almost unclassifiable study, Hawkes used ‘the two sciences of geology and archaeology for purposes altogether unscientific’, weaving them into a romanticised, mythologised vision of the British landscape in which the Palaeolithic overlapped with the present, and the human subject merged with their surrounding environment. Hawkes’ vision resonated strongly with the work of artists such as Moore and Hepworth, who found inspiration for their sculptural fusion of landscape and figure in the standing stones of sites like Avebury and Stonehenge, while the painter Paul Nash sought ‘equivalents for the megaliths’ in his 1935 painting of that name. Two of Moore’s drawings for A Land provide the conceptual kernel of the Yorkshire Sculpture Park’s exhibition. 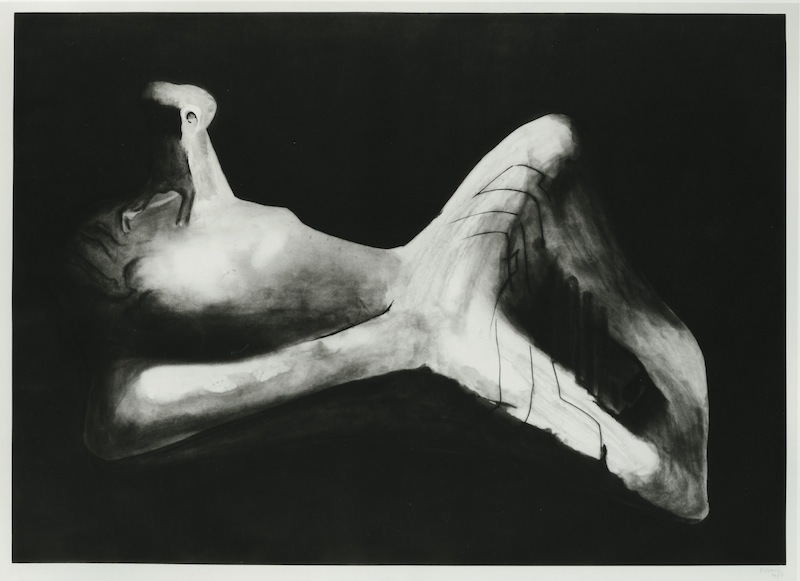 In one, Illustration for A Land: His Lines Follow Life Back into Stone, Moore presents three levels of representation, moving from abstracted biomorphic shapes at the top of the page to a recognisably female figure reclining at the bottom, translating an idea into concrete form while alluding to the organic ‘life’ pulsing beneath sculptural materials. The wax relief used on the figures glows through the overlying wash and watercolour like bone, coral, fossils and shells. These forms, as ‘Back to A Land’ demonstrates, were constant reference points for Moore, and they encourage a fresh perspective on his understanding of land as fragmented, sediment, composed of tiny conglomerate particles and organisms rather than a single navigable totality. Moore’s fascination with bone and shell as materials that are at once architectonic and malleable, simultaneously brittle and soft, is underlined by the ‘project room’ which adjoins the three main rooms of the exhibition. This space brings together selected source materials from Moore’s studios at Perry Green, displaying them in a series of vitrines. In one, a whale’s vertebrae lies like an enlarged sycamore-propeller next to a box of jumbled-together bones and shells; elsewhere a piece of fossil has migrated into a box of pens and pencils. In turn, the shapes of these items migrate into Moore’s drawings. Displayed in the same gallery as Moore’s illustrations for A Land (which is one of the most fascinating rooms in the exhibition), several drawings show Moore tracing out the whorls and concavities of shells and bones with his pencil. Then, in Ideas for Sculpture and Transformation of Bones (1932), the lines of individual elements start to overlap and create new hybrids, the contours of which remain visible in many of the sculptures nearby. Bones, fossils and shells also fascinated Moore because of their connection with stratification and underground existence. ‘Back to A Land’ makes the point that Moore’s conceptualisation of landscape was fundamentally vertical rather than horizontal, linking his famous tube-shelter drawings produced during the London Blitz to his studies of Welsh miners creeping through mineral darkness. The two sites of tube shelter and mine, together with that of the cave, merge to create the subterranean landscape mapped by ‘Back to a Land’ and presented here as a formative influence on Moore’s sculptural imagination. 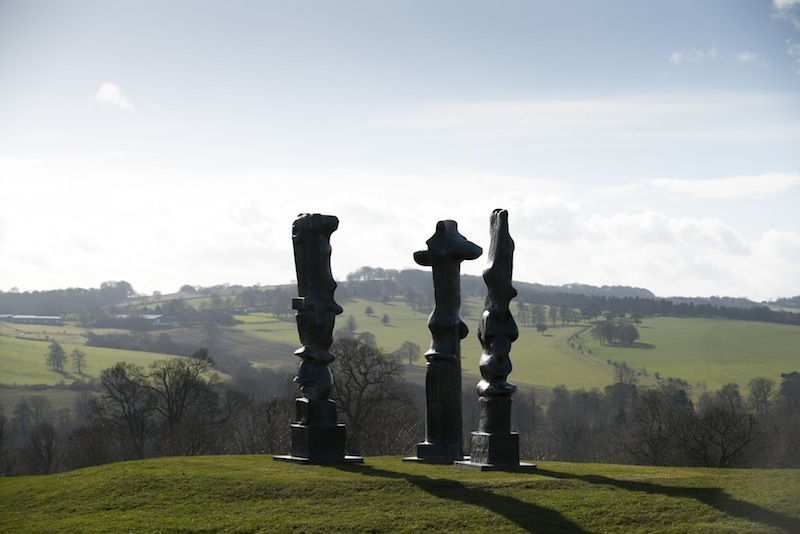 In taking this thematic approach, the Yorkshire Sculpture Park exhibition traces Moore’s experimentation across multiple media rather than just sculptural production. As a result, it shows how Moore’s work might be understood to have reconceptualised sculpture itself as an inherently diversified practice. Alongside Moore’s familiar reclining figures in green bronze, there are strange finds like the drawing Map of 1981, a combination of watercolour, wash, chalk and shaky ball-point pen, in which a telephone-conversation doodle becomes a miniature geography. The curators have also included several large-scale plaster maquettes alongside cast bronzes, making an implicit link between Moore’s fascination with the metamorphic qualities of organic materials and his own working processes. One aspect of the exhibition that calls for greater contextualisation is Moore’s engagement with African, Asian and Latin American sculptural forms. Moore undeniably looked to these works from a primarily formal perspective, but the deeply primitivistic way of thinking that allowed him to do so complicates the understanding of ‘land’ offered here. This is particularly so given the colonial context in which Moore was working, and the legacies of that colonisation into the present. Displaying the ‘Non-Western’ items from Moore’s collection, such as an Eskimo whalebone figure next to his shells and stones might be true to his vision of global sculpture, but it arguably glosses over the tensions between cultural exchange and appropriation that inform the role played by ‘land’ in constructions of identity. The general success of the exhibition, however, lies in its movement away from Moore’s figures and large-scale bronzes, which can start to feel a little ubiquitous, particularly after Moore upped the volume – physical and numeric – of his sculptures in the 1950s and ’60s in response to multiple public commissions. ‘Back to A Land’ instead offers a granular view of his wider sculptural practice, and is all the more intriguing for this shift in focus. 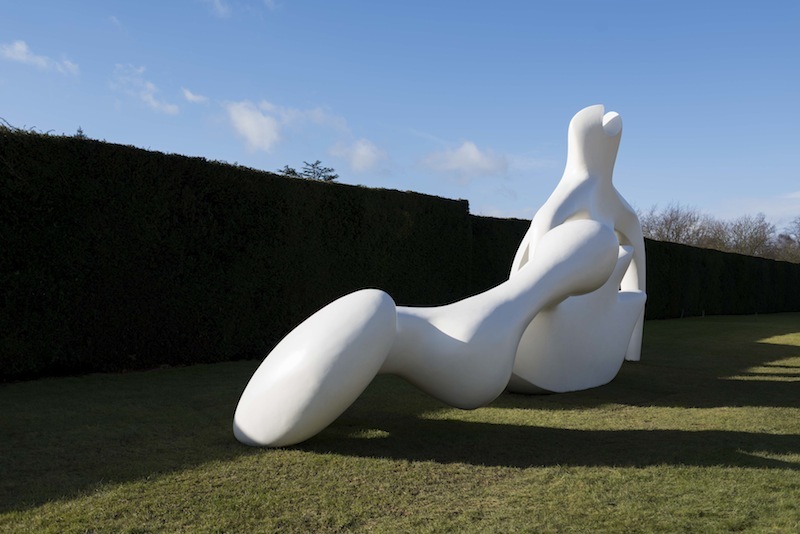 ‘Henry Moore: Back to A Land’ is at the Yorkshire Sculpture Park until 6 September.